We are satisfied to express that we have earned the status of the main maker and exporter of the bitumen weight merchant. As the name recommends it is a proficient framework that is utilized to make an even dissemination of bitumen with speedy and powerful way. It is made administrator well disposed machine that is made with all security safeguard to offer high efficiency. It is accessible with 3000 to 7000 liters limit go. For the predictable operational quality, it is important to spread bitumen with legitimate temperature extend. This Asphalt Equipment contains computerized temperature pointer. To hold temperature for the ideal activity, Asphalt Drum Mixing Plant is giving completely protected tank. It is additionally given air cooled diesel motor with 18.5 KW. It tends to be effectively introduced and set in the truck. It is likewise given skilled weight cleaning framework and hand shower framework. 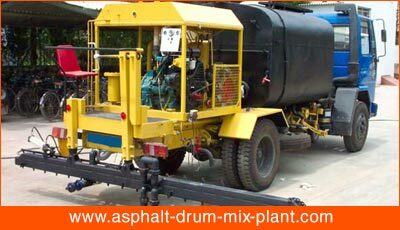 It comprises of pressurized bitumen splashing arrangement of 0 – 6 Kg/cm. The shower bar contains standard width. Upheld by a group of profoundly experienced acquiring specialists, we are affianced in offering an extensive variety of Bitumen weight wholesaler that are inserted with an exceptional weight cleaning support. Our clients spreading over all around the globe utilize this wholesaler for bitumen suspension. Aside from this, our companies offered objects are accessible in the market at the pocket-accommodating cost.